Ancajas after his win in Brisbane, Australia. IBF superflyweight champion Jerwin Ancajas is ready to tackle whatever unpredictable challenger Jamie Conlan brings into the ring in terms of style and strategy when they square off in a 12-round title bout at the SSE Arena in Belfast, Northern Ireland, on Nov. 18. Ancajas, 25, will make the third defense of his 115-pound title against the unbeaten Conlan on hostile territory. It’s a voluntary defense and Ancajas will be paid $80,000 for taking the chance of facing a challenger in his hometown. Conlan, 31, has a 19-0 record, with 11 KOs, but struggled in scoring wins on points over Hungary’s David Koos and Nicaragua’s Yader Cardoza in his last two outings, both in Belfast. Ancajas’ manager and trainer Joven Jimenez said Conlan is no easy opponent. He’s studied tapes of Conlan’s fights and his conclusion is while the Irish fighter is capable of pulling off an upset, Ancajas will retain the title. So far, Ancajas has sparred 80 rounds in training for Conlan. Jimenez assembled a sparring platoon of Pete Penitente, Daniel Lim, Alan Alberca, John Mari Alimane and Jomar Caindog to sharpen Ancajas. In Belfast, working Ancajas’ corner will be Jimenez, Australian cutman Todd Makelim and stablemate Mark Anthony Barriga. Ancajas and his traveling party leave Manila for Belfast on Friday. Jimenez said Ancajas recently moved into a new one-bedroom home in Magallanes, Cavite, about an hour’s drive away from Kawit. Jimenez and Ancajas teamed up to buy a 1,500-square meter property for P2 Million in Magallanes. Ancajas paid P300,000 to build his house where he stays with wife Ruth and their two children Kyrie, 5, and Kyle, 2. Behind the house, Jimenez and Ancajas combined resources to construct a two-storey gym with a 10-room dorm for boxers. The gym is where Ancajas now trains while the dorm on the second floor is under construction. Jimenez and Ancajas are also partners in managing Barriga whose contract they bought for P300,000 from Jason Soong. Ancajas hasn’t lost in his last 14 fights since 2012 when he dropped a majority decision to Mark Anthony Geraldo in Cebu. His record is 27-1-1, with 18 KOs. He wrested the IBF crown from Puerto Rico’s McJoe Arroyo on points in Taguig in September last year. 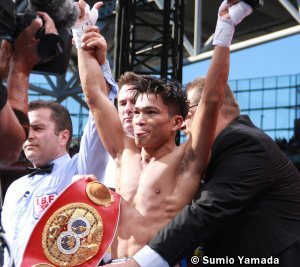 Ancajas has since repulsed challengers Mexico’s Jose Alfredo Rodriguez and Japan’s Teiru Kinoshita. Conlan has won the WBO European, WBO International, British Commonwealth and WBC Silver International superflyweight championships. He started fighting competitively at the age of 13 under his father John and former Olympian Sean McCafferty. Conlan racked up an amateur record of 107-11 then turned pro in 2009, four months after Ancajas’ debut. His younger brother Michael, 25, bagged a bronze medal as a flyweight at the 2012 London Olympics and has a pro record of 4-0, with 4 KOs.